If you are looking for who has run the most Loops, check here. Scroll down to see top finishers and link to complete results for each year. Click on the year (left hand column) to view the complete results for that year’s Loop. We’ve also put together a complete listing of all finishers of The Loop (alphabetically) as a bit of an experiment. For the 30 years the Leatherman’s Loop has been run, there have been several slightly different course lengths. We had one “detour” course used for one year (2007) due to heavy rains. We added a surprise additional water crossing starting in 2010. The initial course, a slightly shorter course, was run from 1987-1992. In 1993, the course was changed close to its current layout. The new course replaced the “log crossing” with the first river crossing when the log that served as an ad-hoc bridge tumbled into the river and was swept away (not during the Loop, thankfully). The new course also bypassed “The Pit” which is a sand hill just before the water stop. A rare plant species was identified near the base of the pit sand climb and the park officials and loop organizers deemed it prudent to let the plant grow in peace at the time. 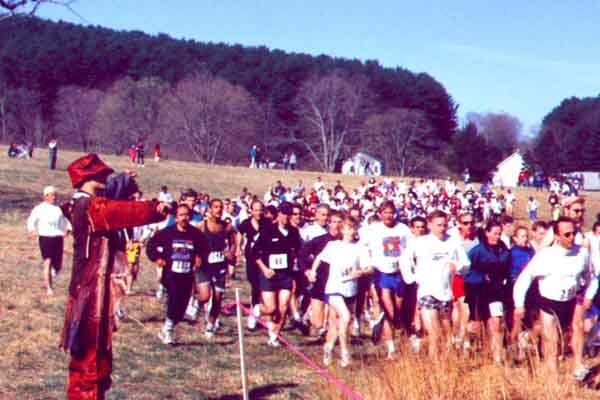 After 1993 the course start was switched from the meadow parking lot to the current start a quarter mile west into the meadow, lengthening the course. This also allows the start crowd to thin out before heading into the woods. One year, 2007, the Splashdown (second stream crossing) was rerouted over dry land making it a one water crossing loop again for one year. The river had such a high water level due to days of rain prior to the Loop that the currents were thought too dangerous to cross at that point. This one-year-only change added approximately ~0.2miles to the course in 2007. In 2008 the course was restored to its proper length. In 2010 a bonus water crossing was introduced: “Sullivan’s Surprise” is just before the water stop and just under the halfway mark of the course. In 2013 the course had to be re-routed in several places due to damage from Hurricane Sandy in Fall 2012. The new course was slightly shorter (~50 yards) but went up and over a hill that the course had previously gone around, adding a tough new hill towards the beginning of the course. Tommy Nohilly has finished first in nine of the 13 Loops he has entered, coming in second two times and sixth the last. Matthew Byrne set the most recent course record (36:10) in 2012 on the driest course in 30 years. Kerry Arsenault has finished first in seven Loops, starting in 1994. She just missed a eighth in 2010, coming second after Margaret Butler. Kerry also holds three different course records for three different course variations (44:50 in 1994 is her quickest time) for the women’s division. Mark McIntyre (35:17) and Cindy Davis (42:51) hold the short course (1987-1992) record when the log crossing was in place, the course started from the Meadow parking lot, and the course was shorter. Mountain runner Dave Dunham holds the course record (36:51) for the medium length course run 1993-1999. Other multiple Loop winners include Andy Moffatt (2), Tom Church (2), David Litoff (2), and Gerry Sullivan (2). Cindy Davis and Ann MacDonald are the only other women to win multiple Loops. Cindy won the first three Loops held (1987-1989). Ann won back to back in 2011 and 2012. Laura Coogan won her first Loop in 2013 and is already talking about returning to defend in 2014. Joe Stanley won the first Leatherman’s Loop in 1987, beating a field of 98 starters. Joe has run in every Leatherman’s Loop since the beginning including 2011. Our other 25-timer, Rick Hubbell finished the loop in 2011, wearing Bib #25, along side of Joe. Both Joe and Rick ran again in 2012. Joe ran his 27th Loop in 2013 but Rick was unable to attend. Fun Fact: If we followed the tradition of several sports and named the winner’s award after the first place finishers in the first race we would have the Davis Cup for the Women’s division and the Stanley Cup for the mens! We hear those names are taken though, oh well. The oldest runners to complete the Leatherman’s Loop were Don MacKenzie at 81 years old in 2003 and John Young at 81 in 2015. Don is a former Olympian and occasionally comes back to the Loop to cheer the runners on. The youngest runner we know about was Orion Cummings who was 7 years and a few months old when he completed his first Loop in 2009. He has run in every Loop since then (8 and counting). In 2014 Nadia Kaye ran the Loop at age 7 1/2 years old and is the youngest girl to run the course. Searchable results are here for the following years: 2016, 2015, 2014, 2013, 2012, 2011, 2010, 2009, 2008, 2007, 2006, 2005, 2004, 2003, 2002, 2001, 2000, 1999, 1998, 1997, 1996, 1995, 1994, 1993, 1992, 1991, 1990, 1989, 1988, and 1987. Images (photos) of the original source materials – the posterboard results – are available for these years: 2004, 2003, 2002, 2001, 2000, 1999, 1998, 1997, 1996, 1995, 1994, 1993, 1992, 1991, 1990, and 1989. Thanks to Mel Cowgill for his transcribing labors! View the originals on posterboard that Mel worked off of to type in the results. Contact us with any corrections. Below are some expanded stats on each year’s race. On the right are columns for number of finishers, the time of the runner at the top quartile break, the number of the runner at the top quartile break, and the time of the 100th runner through the finish line. Each of these additional stats gives you an idea of the relative difficulty of the race that year based on the conditions and the number of runners. For example, in 2002 and 2006 it was raining heavily before and during the Loop which drove down the attendance. In 2008 the conditions were relatively dry and the course was faster. In 2009 it was 80 degrees at the start and warmed up during the race. In 2012 the conditions were the driest ever run – mud flats were fast and water was low. No moisture on the course made for 4 runners breaking the previous record for the course and the fastest time for the Loop since it was a slightly shorter course prior to 1993.